The Life Hacks 2019 Day-to-Day Calendar contains helpful hints to read and share, like using frozen grapes to chill wine without watering it down, planting flowers in a diamond pattern to make a bigger impact and save money, adding sprinkles to the bottom of an ice cream cone to prevent leaks, and removing scuffs from shoes with nail polish remover. Life hacks are tips, trips, and shortcuts that solve common problems, increase efficiency, and improve ordinary tasks at home, work, school, and on the go. 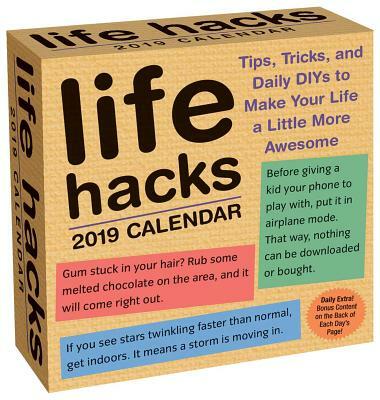 This calendar includes interesting and practical ideas from the 1000 Life Hacks website and mobile app on subjects such as food and drink, technology, wellness, student and professional aids, saving money, and more. Holiday Shopping Hack: Get them this calendar.